After bringing precisions to the meaning we give to several of the terms used in this chapter (e.g., robustness, result, procedure, method, etc. ), we highlight the principal characteristics of most of the publications about robustness. 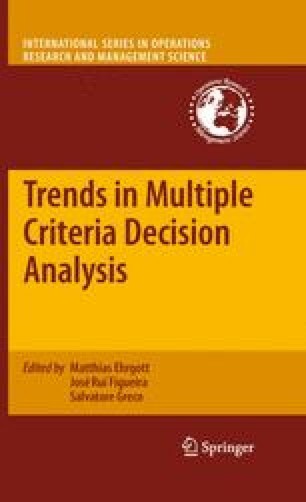 Subsequently, we present several partial responses to the question, “Why is robustness a matter of interest in Multi-Criteria Decision Aiding (MCDA)?” (see Section 4.2). Only then do we provide an outline for this chapter. At this point, we introduce the concept of variable setting, which serves to connect what we define as the formal representation of the decision-aiding problem and the real-life decisional context. We then introduce five typical problems that will serve as reference problems in the rest of the chapter. Section 4.3 deals with recent approaches that involve a single robustness criterion completing (but not replacing) a preference system that has been defined previously, independently of the robustness concern. The following section deals with approaches in which the robustness concern is modelled using several criteria. Section 4.5 deals with the approaches in which robustness is considered other than by using one or several criteria to compare the solutions. These approaches generally involve using one or several properties destined to characterize the robust solution or to draw robust conclusions. In the last three sections, in addition to describing the appropriate literature, we suggest some avenues for new development and in some cases, we present some new approaches. Newsletter of the European Working Group “Multiple Criteria Decision Aiding”. Newletter of the European Working Group “Multiple Criteria Decision Aiding”. Available online at http://www.inescc.pt/~ewgmcda/Articles.html, 2002-2007.